Pro Staff Spincast these are all time favorites for multi-species anglers across the US. The entire Pro Staff product line was redesigned and updated in 2007 to enhance its utility and quality. 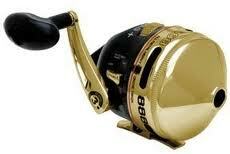 The Pro Staff range of fishing reels features 5 reels- one baitcast, two spinning and two spincast reels. They come as a combination of reel and rod with a much better split-grip design for rod handles. The fishing reel is pre-spooled with 6 lb 130 yards line. A line weight indicator is present at the rear end alongside the thumb button which allows the users to change settings any time they wish. This entry was posted on Friday, April 20th, 2012 at 9:35 am	and is filed under Fishing Equipment, Fishing Reels, Spincast Reel, Tips. You can follow any responses to this entry through the RSS 2.0 feed. You can skip to the end and leave a response. Pinging is currently not allowed.